Learning guitar scales is like anything else, it takes time. However, understanding not only the importance of scales but also how / when to use them is vital. That being said, if you want to take your playing and knowledge to the next level, learning your scales as well as how to use them in a creative way is what you need to master. This article is going to cover various aspect of guitar scales including everything from what exactly is a guitar scale to teaching you some of the most popular scales that exist. Which Scales Are Used in Certain Types of Music? Before diving straight into learning guitar scales and how to play them, it’s important to learn a little more about what a guitar scale actually is. As we’ve covered in a previous post regarding learning the notes on the guitar fretboard there are 12 notes in Western music. A scale is simply a manner of ordering a particular combination of those 12 notes in a way that sounds good. To put it in real-life terms, think of guitar chords as words and scales as the alphabet. Knowing the alphabet allows you to put letters together to make words. Therefore, you have much more creative freedom and range to work with. Similarly in guitar, knowing scales gives you the knowledge needed to build upon an existing foundation (i.e. a chord progression) or create something entirely new (i.e. a chord derived from a scale). There are many variations of scales that exists and they can be used for many purposes, which we’ll cover in more detail in the next section. One of the most important things to know before jumping into guitar scales blindly is knowing why they are important. Knowing this gives you a greater respect for guitar scales. 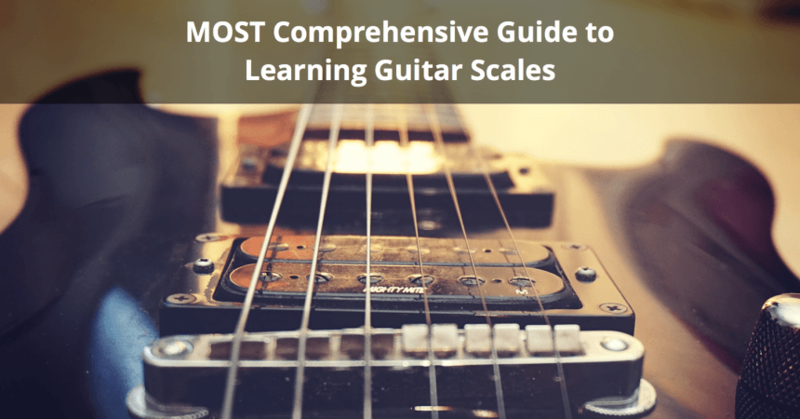 Heck, maybe even for those who think they don’t need to learn scales will reconsider after learning why they are vital if you want to advance in guitar. 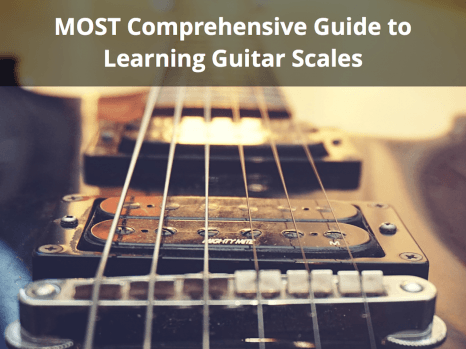 I’ve already mentioned a few reasons at the start of this post why it’s important to learn scales, however here are a few more reasons explained in greater detail. Exercises – First off, learning guitar scales is great practice to improve your finger agility. Running up and down each scale time after time will help your finger muscles grow strong and will also enable them to move faster as you progress. Being able to move your fingers faster will help for a variety of reasons such as chord changes, faster soloing, etc. Soloing – Scales play a huge role in how solos are made. Knowing your scales and knowing how to use them will allow you to become comfortable in soloing over a particular chord progression in any key. Scales will also help you understand solos that you listen to. Have you ever heard a solo and thought to yourself, “how did they come up with that?”. A good solo is part creativity and part knowing the basics behind guitar theory. Once you know your scales and become comfortable with them, you’ll be able to solo up and down the fretboard with much greater ease. Better understanding of chords – Scales are essentially the foundation of chords. As was explained in the what is a guitar chord article, a C major chord is created by taking the C major scale and selecting the first note, skipping the next, taking the next, skipping the next, and taking the next. These 3 notes from the C major scale create the C major chord. This process (in different variations) is used for creating chords from scales. Improved ability to write music – Knowing your scales can increase your ability to write music as you’ll have a set of rules for what sounds good together and what doesn’t. Chord progressions can also be derived from scales which can help you in the writing of a song. Similar to soloing, scales can also help provide you with ideas for licks and riffs that will help complement a song. A greater appreciate for music in general – This reason won’t make you a better guitar player, however I believe that knowing your scales will give you a better appreciation for music. As you’ll know more about music theory, you’ll realize that there is a certain amount of structure to creating a piece. The wonderful thing with music though is that it doesn’t always have to follow a predefined structure. You may create something that shouldn’t “in theory” sound right however sounds great when play a certain way. Remember, you should know the rules before you start breaking them ;). Depending on the style of music you play, it may not be worth it for you to learn certain scales. Of course, the more scales you learn the more familiar you’ll be in playing various types of music. However, no one wants to put time and effort into learning something they know they’ll never use. That’s why the following list outlines the scales that you can safely use in various genres of music. That’s not to say that a scale not defined for a genre in the list below won’t work, rather this list contains scales commonly used in the following genres. If right now you’re only interested in a certain genre of music, learn the scales that work best with that genre first. As previously mentioned, think of the above list as a starting point for learning guitar scales. This should help you decide which ones you want to learn first, however no genre is specifically limited to the associated scales. A genre is not defined by the scale you use but rather the time signatures, chord progressions, how it’s arranged and played, etc. This section will cover the most popular guitar scales that you should learn as both a beginner and intermediate guitar player. I wouldn’t recommend starting to learn scales right off the bat as a beginner guitar player. Start off with a few basic chords and get a few songs under your belt before you start diving into scales. If you’re a beginner, I would recommend checking out the post I wrote, How to play guitar, an easy beginner’s how-to guide. That being said, the beginner’s section contains 3 important scales to learn while the intermediate section contains another 4 scales. Whether you’re a beginner, intermediate, or advanced, all of these scales are important and should be eventually learned to help further your playing ability. We’ll start off with the beginner scales. The following 3 scales are quite essential for all guitarists as they are versatile and amongst the easiest scales to learn. The diagram shown for each scale below was created for the key of A (all A notes in the diagrams are highlighted in green). However, you can use the exact same patterns for different keys, therefore the patterns are moveable. For example, the minor pentatonic example below shows that pattern 1 starts at fret 5 on the low E string. Therefore the root note, in this case, is A. However, if we wanted the root note to be F, then we could take the same pattern and start playing it from fret 1 (aka. the F note) on the low E string. 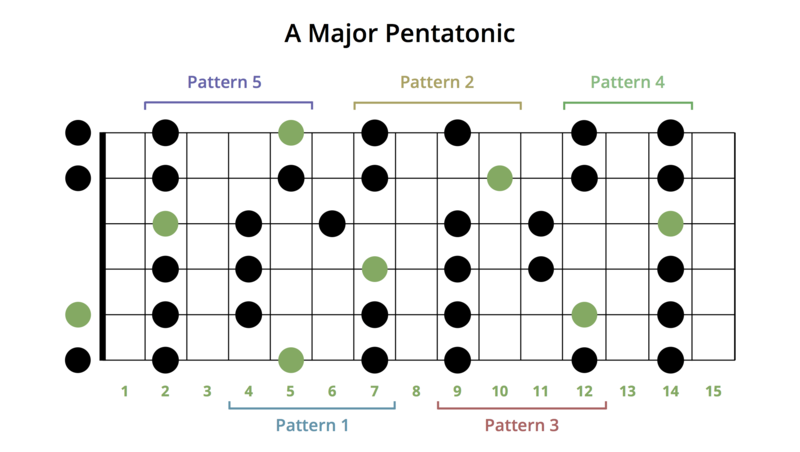 The minor pentatonic scale is a fantastic first scale to learn. It is a 5 note scale and is usually played over chord progressions that start with a minor chord. The example below shows where the patterns would be played if you were to use A as your root note. To help visualize the above diagram a little better in terms of patterns and how each should be played, reference the tabs below. 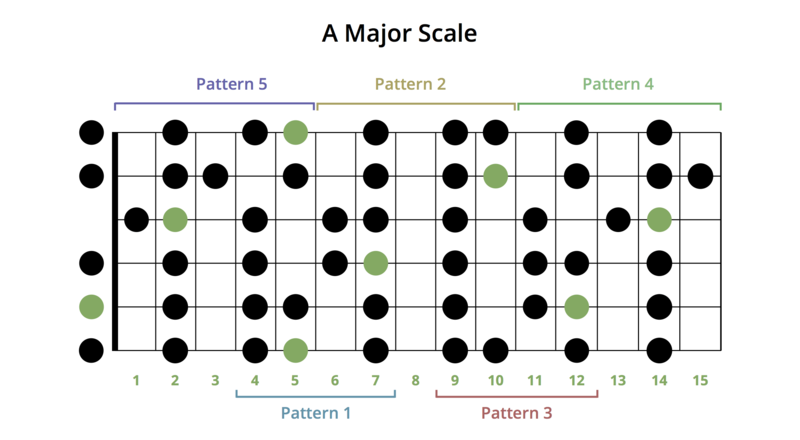 The patterns for this scale and all additional scales are also shown in the guitar scale chart further down. Referencing the chart should help you better visualize what each pattern should look like. The major pentatonic scale is another 5 note scale and is used to play over chord progressions using major chords. 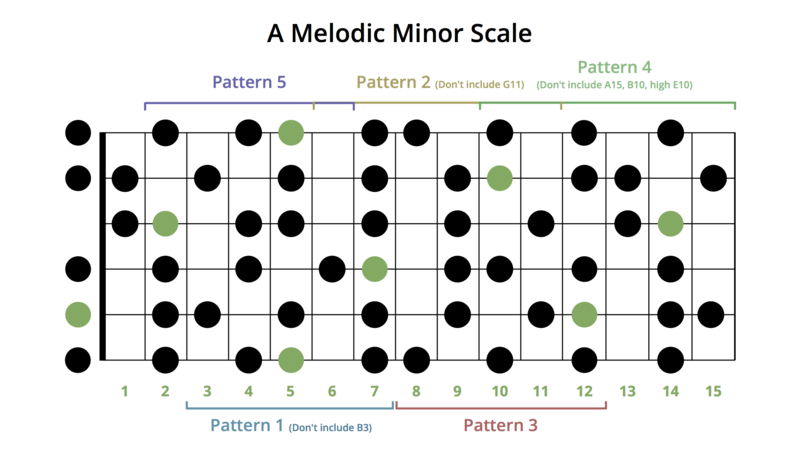 This scale contains all the same pattern shapes as the minor pentatonic. The difference lies in the positioning of the patterns. Think of it as if all patterns move back one position. For example, pattern 1 in A minor pentatonic now corresponds to pattern 5 in A major pentatonic. Pattern 2 in A minor pentatonic corresponds to pattern 1 in A major pentatonic, and so on. The blues scale is often easily learned after the minor pentatonic as it contains the same patterns however just includes an additional note. The additional note is what gives the scale that signature blues sound. 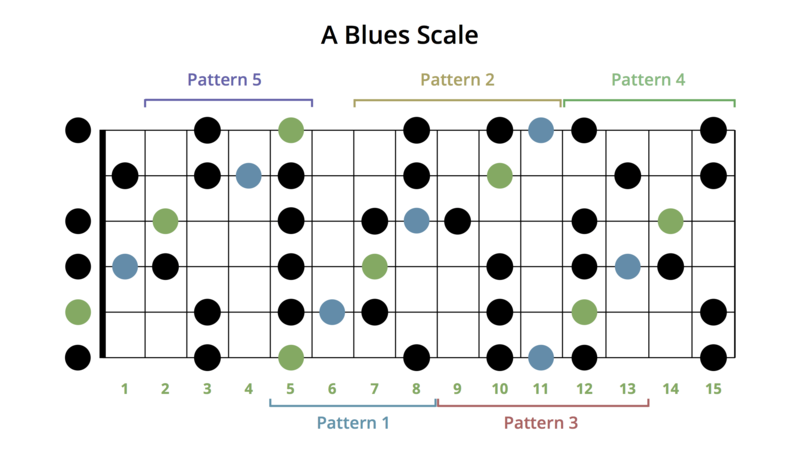 The diagram below shows the pattern placements for the blues scale in the key of A. Again, the green dots represent the root note while the blue dots represent the additional notes that were introduced with the blues scale. The following scales are slightly more advanced. They have more notes within the scale itself and their patterns are different than the 3 scales mentioned above. Once you are comfortable in using the pentatonic and blues scales, move on to learning the major scale and natural minor scale. The 2 additional scales provided (harmonic and melodic minor) are more focused towards jazz players, however, are great to have in your toolkit. The major scale is arguably the most important scale you can learn. It is used widely in many types of music and understanding it will help you better understand how chords are created along with other theory-related concepts. The formula used for creating the major scale is: whole step, whole step, half step, whole step, whole step, whole step, half step (W – W – H – W – W – W – H). The diagram below shows the 5 different patterns of the major scale in the key of A. Start at the root note for these and work your way up the scale and back down, playing all notes and ending back where you started (i.e. the root note). The natural minor scale is also known as the Aeolian mode (modes discussed more further below). The formula for the natural minor scale is W – H – W – W – H – W – W. The minor scale can also be achieved by lowering the 3rd, 6th, and 7th notes of the major scale by a half step each. The harmonic minor scale is useful is you are playing Jazz music. It is quite similar to the natural minor scale in that the patterns are the same except for the 7th note which is raised by a half step. The formula for the harmonic scale is W – H – W – W – H – W+H – H (notice the step and a half). Finally, the melodic minor is another one of those scales not often used in many genres besides Jazz. The formula for this scale is W – H – W – W – W – W – H.
Modes are a fairly simple concept when you get a grasp of how they are formed, however learning this can take some time and will be further explained in another article. This section however, will give a quick primer into modes. A mode is simply a scale that has been altered in terms of sequence. However, they are the same as the major scale, the difference lies with which “base” note you start with. For example, the C major scale starts with the C note and ends on a C note an octave higher. This scale follows the pattern: W – W – H – W – W – W – H which corresponds to the following notes: C – D – E – F – G – A – B. This is commonly known as the major scale, however, is also called the Ionian mode. However, if we were to start the scale off with the second note in the C major scale (the D note), the pattern would change to W – H – W – W – W – H – W and correspond to the following notes D – E – F – G – A – B – C. This mode is called the Dorian mode. There are 7 types of modes in total. Each mode along with their respective patterns are listed below. Ionian – Starts with the tonic or root note. In the key of C this would correspond to the C note and is the same as the major scale. The corresponding interval pattern is: W – W – H – W – W – W – H.
Dorian – Starts with the second note in the scale (e.g. in C major this would be to the D note). The corresponding interval pattern is: W – H – W – W – W – H – W.
Phrygian -Starts with the third note in the scale (e.g. in C major this would be to the E note). The corresponding interval pattern is: H – W – W – W – H – W – W.
Lydian – Starts with the fourth note in the scale (e.g. in C major this would be to the F note). The corresponding interval pattern is: W – W – W – H – W – W – H.
Mixolydian -Starts with the fifth note in the scale (e.g. in C major this would be to the G note). The corresponding interval pattern is: W – W – H – W – W – H – W.
Aeolian – Starts with the sixth note in the scale (e.g. in C major this would be to the A note). The corresponding interval pattern is: W – H – W – W – H – W – W.
Locrian – Starts with the seventh note in the scale (e.g. in C major this would be to the B note). The corresponding interval pattern is: H – W – W – H – W – W – W.
You can then use these modes and transpose their pattern intervals to work within a particular key. For example, looking at the C major scale as an example again, the notes are: C – D – E – F – G – A – B. If we apply the interval pattern of the Dorian mode (W – H – W – W – W – H – W) to the C major scale, the notes would be: C – D – D# – F – G – A – A#. Move up and down the complete scale pattern – Doing this will not only help you familiarize yourself with the pattern of the scale but it also doubles as a warm up exercise. Ensure that you closely examine the pattern that you’re playing and move all the way down and all the way back up the scale pattern without stopping. It is also recommended to perform this exercise in time with a metronome to help keep your fingers moving at a steady pace. Speed bursting notes – This technique involves playing the first note of your scale and then playing the next 3 notes in quick succession. Once you’ve played the speed bursted 3 notes, start over again but this time at the second note of the scale. So, if we were to number each note of the scale, this exercise would look like: 1 – 234, 2 -345, 3 -456, 4 -567. Practice this exercise in both ascending and descending fashion. Randomize the notes – Once you are fairly comfortable with the notes that exist in a scale pattern, try randomly playing each note to a metronome or a backing track suitable for the scale you’re playing. This will help break out of the structured sound that your solos may have when first learning how to use scales. I’d recommend checking out guitarjamtracks.com for some backing tracks you can practice your scales over. This site allows you to find backing tracks by key, scale, and genre. Additionally, if you want to make your own little backing track, simply record a looped chord progression in a DAW such as GarageBand or Logic or get a looping app like Loopy. The guitar chart below lists all of the scales we discussed above along with the patterns for each. The scale diagrams are still shown in the key of “A”, however, remember that this can be modified to whatever root note you would like. If you remember the positions associated with each scale along with the guitar fretboard notes, you’ll be very well off in terms of knowing what to play and when. Again, the green dots represent the root note while the black dots represent all the other notes in the scale. Additionally, you will notice that there are numbers on the pattern diagrams. These numbers correspond to which finger you should be using to play each note. I also wanted to mention a few guitar scale tools you can use to help in finding certain scales or determining which scales should be used over a particular chord progression or lick. Check out the following tools to help you out whether you’re on your laptop or mobile device. 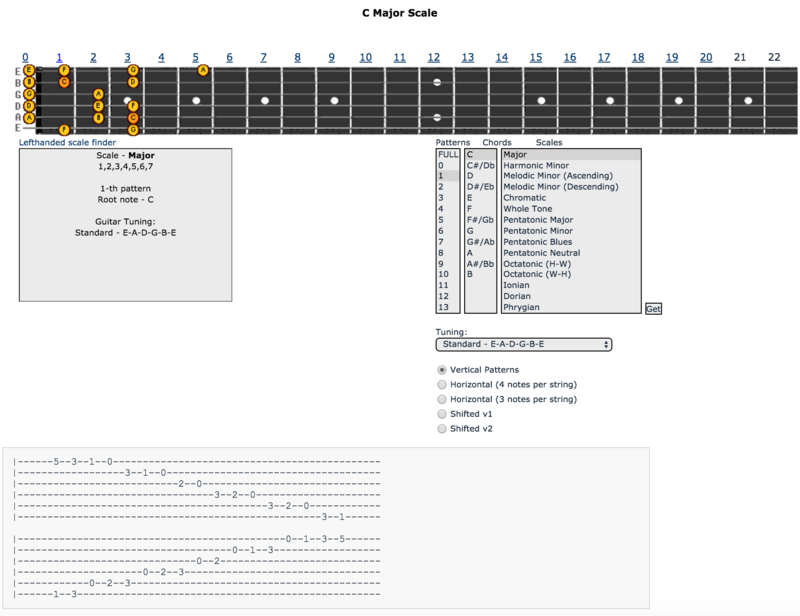 All-Guitar-Chords Scale Tool – This guitar scale tool is one of the most comprehensive tools I’ve been able to find. It lists a huge amount of guitar scales, and can show you either the full pattern or a single pattern of the scale on the guitar fretboard. It also displays a tab of the scale once you have selected a single pattern. Guitarist Source – This is another tool similar to the one mentioned above. Simply select the type of scale you want and you can define the key for which you want the guitar fretboard to populate the appropriate notes in that scale. Guitar Scales Power (iPhone App) – This guitar scales app for iPhone is great for when you’re on the go and need to look up a particular scale. It also provides you with a full-scale view as well as a view of each individual pattern based on your choosing. It offers a ton of scales to choose from and a few additional options such as various tunings, different orientation, etc. Guitar Pro Scales Tool – Lastly, the Guitar Pro 6 tablature software also comes with a handy guitar scales tool. With this tool you can see how to play a particular scale on a guitar fretboard. An additional, really cool feature, is that the tool also allows you to select a particular riff/chord in your tablature and the software will return a list of scales that will work appropriately with your selection. Learn more about the Guitar Pro 6 scales tool with this video. This post has covered a ton of information and it may take a while to go through all of it. However, I wanted to finish with a few additional tips for learning guitar scales that you’ll want to follow. When practicing your scale patterns ensure that you start off slow. This is crucial as you should first learn how to play the scale pattern 100% correctly before going faster. It is only once you are comfortable with the scale should you start increasing the speed that you play it. There are a couple of ways to play a scale pattern. You can start from the top of the scale and work your way down, then back up, however, it is recommended to start off on the lowest pitched root note when you first start practicing. This will help your ear in providing it with a “home-base” note to start off and end with. Therefore start with the lowest pitched root note, work your way up the scale, then down as far as you can go, then back down to the original root note. Ensure that you learn each pattern individually and practice using that pattern before moving on to the next. This is important to help your brain memorize the pattern you’re learning and to help you discover what is possible with that pattern before simply moving on and memorizing the next one. That’s it for this guitar scales post. Let me know in the comments section below if you have any questions and I’ll do my best to answer them for you!